The mission of the Altar Guild is to assist the clergy. An efficient Altar Guild assures an orderly setting so that the members of the congregation can worship with ease. Altar Guild duties include setting up, taking down and cleaning up after the weekend services and the mid-week service. The Altar Guild is responsible for laundering and maintaining linens, cleaning vessels, and maintaining the sacristy. Members also set up and take down baptisms, funerals, weddings and special services such as the Bishop’s visit, ordinations, Advent and Christmas, Ash Wednesday, Holy Week and Easter. Members maintain altar candles, Advent candles, pew candles, and the prayer candles in the chapel. Two “work days”— one before Easter and one before Christmas—allow the Altar Guild to meet for general clean-up along with additional tasks such as polishing silver and setting out special decorations. 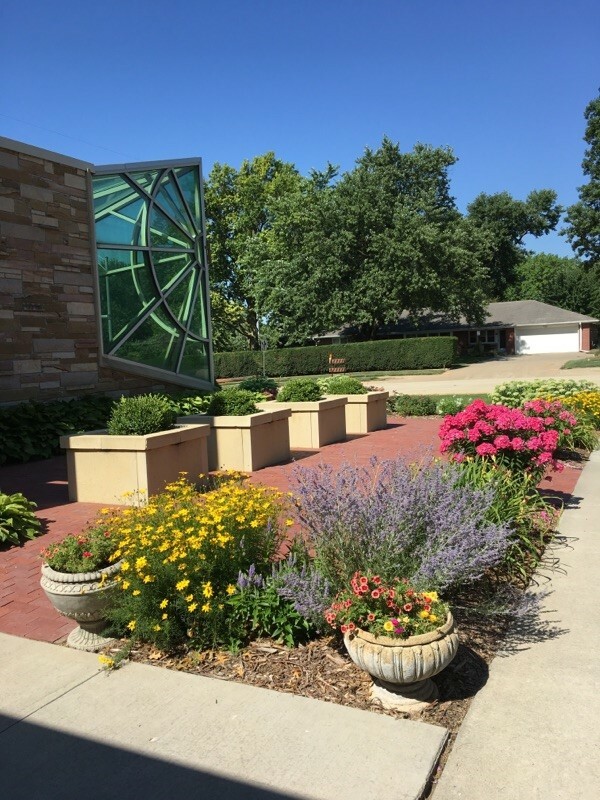 The Altar Guild is also responsible for ordering and caring for the weekly altar flowers, the poinsettias at Christmas, and the lilies at Easter. The Altar Guild Flower Chair coordinates with local florists to accommodate the Altar Guild’s floral needs. When altar flowers are available after Sunday services and when appropriate, the Altar Guild shares/recycles—rather than discarding— the altar flowers by moving them to various locations around the church (columbarium, office, entryway) and redistributing them to members of St. Andrew’s who are sick or hospitalized, or who simply need some cheering. The active members of the Altar Guild are supported by an informal auxiliary “Friends of the Altar Guild” who assist the Altar Guild by hanging wreaths, draping the cross, moving flowers, carrying items in and out of storage, donating communion wine, and filling pew candles among many other tasks. Altar Guild meetings, preceded by communion in the chapel, are held the first Wednesday of each month from September through May. At these meetings members share information, volunteer to set up and take down services, and plan for the coming month. Please contact us for further information. 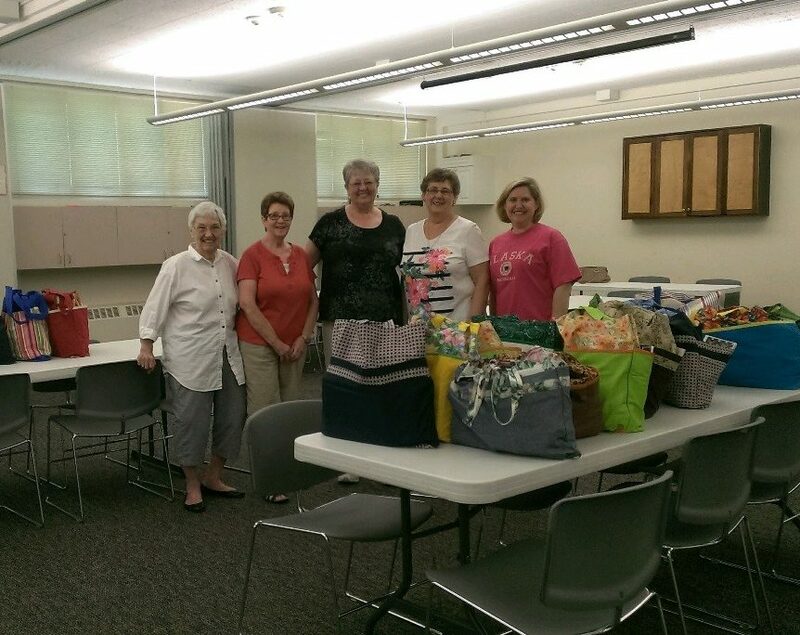 the main ministry we have chosen to support is providing “Welcome Bags” to the St. Monica’s Home in Lincoln. The home provides substance abuse treatment for women, many of whom arrive with nothing more than the clothing on their backs. We provide a handmade bag containing new towels, toiletries, and a note of encouragement to assure that their basic needs are met when they arrive for treatment and they know that they are not facing the upcoming challenge alone. We meet once per month, September through May, and have a luncheon followed by a short meeting, and a short program. Generally, our meetings take place on the third Wednesday of the month, at noon, downstairs at the church. There are a few exceptions, where we have a dine-out luncheon at a local restaurant, our Christmas luncheon at a member’s home, and when we work the Cut-N-Chop for the annual Antique Show the Wednesday following Easter. Our luncheons are provided by hostess teams that take turns providing the meal, and arranging the program. Our programs range from guest speakers, devotionals, fellowship games, and even members sharing a recent trip experience with our group. St. Monica’s Guild is a wonderful place for fellowship, and all women of St. Andrew’s are welcome. If you are interested in coming to a luncheon, Please contact us for further information. Ushers – distribute service leaflets to the congregation, assist with seating (when necessary), take the wine and bread to the altar, collect the offering, assist with directing people to communion. The Reception Team ministry is to provide hospitality for funerals and seasonal/occasional events at St Andrews. The five teams are each comprised of 15 women and a Reserve Team of 20. Two “seasoned” chairwomen oversee each team. 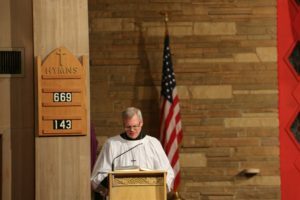 Events for which we provide hospitality include: Memorial Luncheons (following funerals), the Bishop’s Annual Visitation, Ordination Celebrations, coordinating the luncheon for the Annual Meeting, the Kick-off meal for the Episcopal Church Women (ECW), and other diocesan gatherings. We use both Engle Hall and the downstairs Parish Hall. If you are interested in joining our “fun” group and feel called to a ministry of hospitality, please contact us for further information.. The buildings and grounds committee, along with our lawn care volunteers, work hard to keep St. Andrews’ physical property safe, clean and inviting. This includes mowing, We are in constant need of volunteers who have expertise, or just enjoy, building and yard maintenance or landscaping. Please contact the parish office if you would like to volunteer. St. Andrew’s Fun Club is a great way to get to know your fellow parishioners a little better while participating in games and special events. Events include a monthly happy hour for adults, and special family-centered events. For a detailed list, check our calendar. If you are a woman at St. Andrew’s, you are a member of the ECW – Episcopal Church Women! Our mission is to support our parish and outreach in efforts that benefit primarily women and children. We host several events during that year that have included: college care packages, movie nights, speakers and the annual Women’s Retreat. We start the year off with a Kick-Off dinner for all women and that wonderful dinner sets the tone for the rest of the year! Each Saturday morning at 8:00 am the men of St. Andrew’s meet for reflection and discussion about a book they are reading. All men are invited. The discussions last about an hour and coffee is provided. The group meets in the comfort of Havilland Hall.